CHARLESTON, S.C., June 1, 2018 — On the evening June 5 and the early morning of June 6, Joint Base Charleston here will conduct a real-time historical re-enactment of World War II’s D-Day invasion, solely on social media. Starting at 7 p.m. EDT, both the 437th and 315th Airlift Wings will start Facebook and Twitter posts as if the D-Day invasion is happening in real time, as it did 74 year ago, through the eyes of their predecessors, the 437th and 315th Troop Carrier Groups. During World War II, a total of 821 allied C-47 troop carrier aircraft took off at planned intervals from bases in England during the D-Day invasion of Europe, June 6, 1944. 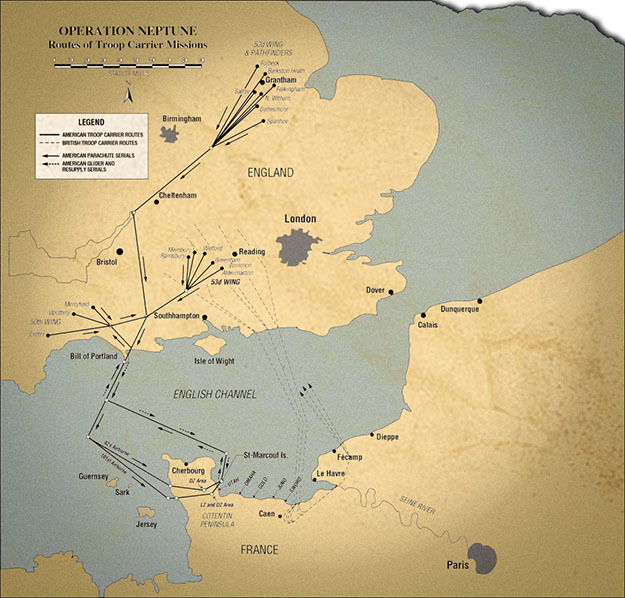 They all passed over check point Bill of Portland at their assigned altitudes at their designated times in a long string headed toward Normandy, France. On the evening June 5 and the early morning of June 6, 2018, Joint Base Charleston, S.C., will conduct a real-time historical re-enactment of the D-Day invasion, solely on social media. Starting at 7 p.m. EDT, both the 437th and 315th Airlift Wings will start Facebook and Twitter posts as if the D-Day invasion is happening in real time, as it did 74 years ago, through the eyes of their predecessors, the 437th and 315th Troop Carrier Groups. Air Force image. The 437th Airlift Wing can be found on Facebook at www.facebook.com/437AW and Twitter at twitter.com/437AW. The 315th Airlift Wing can be found on Facebook at www.facebook.com/315AW and Twitter at twitter.com/315AW.